Wizards win their 16th straight at Verizon Center behind 33 from Wall. John Wall leads the way with 33 points (14 in the fourth quarter) as the Wizards hold off a feisty Lakers team for their 16th straight victory at Verizon Center, 116-108. Markieff Morris (12 points, 11 rebounds) and Marcin Gortat (21 points, 14 rebounds) each had double-doubles while Bradley Beal added 23 points, shooting 5-9 from three-point range. Bradley Beal came out scorching the nets tonight as he connected on his first five three-pointers, three of which coming in the first quarter. The Wizards made it a point to get Gortat going early which paid dividends as the big man turned in a monster performance. The Wizards shot 41 percent from the field but Los Angeles was letting it fly from three (5-12) as the game was close, 31-29 after one quarter. The third quarter was a different story. The Wizards got off to a slow start this time knocking down four of their first 12 field goals from the field. D’Angello Russell caught fire knocking down a couple of three-pointers and all of a sudden, the Wizards 19-point lead was cut to julst 11. Fortunately for the Wizards, Gortat scored 13 of his 21 points in the third period to maintain a 90-79 lead. A three-point field goal from Jordan Clarkson and three free-throws from Lou Williams had the Lakers faithful at Verizon Center erupting as the baby Lakers cut the Wizard lead down to six, early in the fourth quarter. The Lakers used a 9-0 run to tie the game at 91 as the Wizards’ 19-point lead was erased. 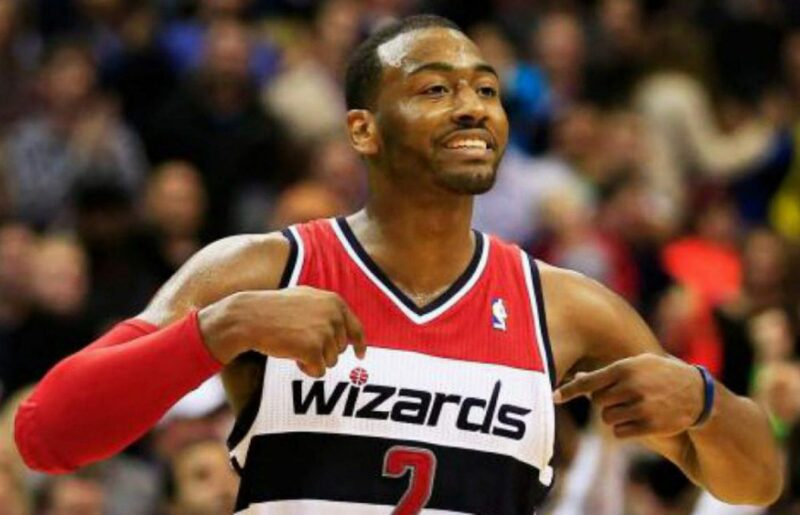 John Wall flipped the switch scoring eight straight points for the Wizards as they’d regain the lead 99-93. Wall would hit two key fourth quarter jumpers as he scored 14 points in the period and the Wizards outlast the Lakers, 116-108. Probably the most overlooked player during this hot stretch for the Wizards is Marcin Gortat. Gortat has 28 double-doubles on the season, just one short of Wall’s 29. Gortat had one of his more explosive games of the season with 21 points and 14 rebounds. He took control in the third quarter with 13 points during a time when the Wizards struggled to score the ball. Gortat was extremely efficient knocking down 10 of his 13 field goal attempts (77 percent) and knocked down his only free-throw attempt tonight as well. Turnovers have been a major issue for Washington but not tonight. The Wizards committed just 12 turnovers resulting in just six points for the Lakers. In the past, the team has committed some errant passes often leading to easy baskets on the other end for the opposition. Luckily for the Wizards, the Lakers are one of the worst defensive teams in the league so no only did they not force Washington into pressure situations, they were unable to capitalize as well. As mentioned, Wall scored 14 of his 33 points tonight coming in the final frame. Wall hit two three-pointers to get things started only to knock in some key clutch jumpers from his favorite spot on the court, the elbow, down the stretch. Things were tense at Verizon Center after a 19-point lead evaporated but John Wall scored eight straight points for the Wizards to regain the lead. Everyone loves talking about Wall’s jumper, and tonight he proved that he can knock it down with confidence when the game is on the line. Previous postAll five starters score in double figures as Wiz cruise to 117-101 win over New York.